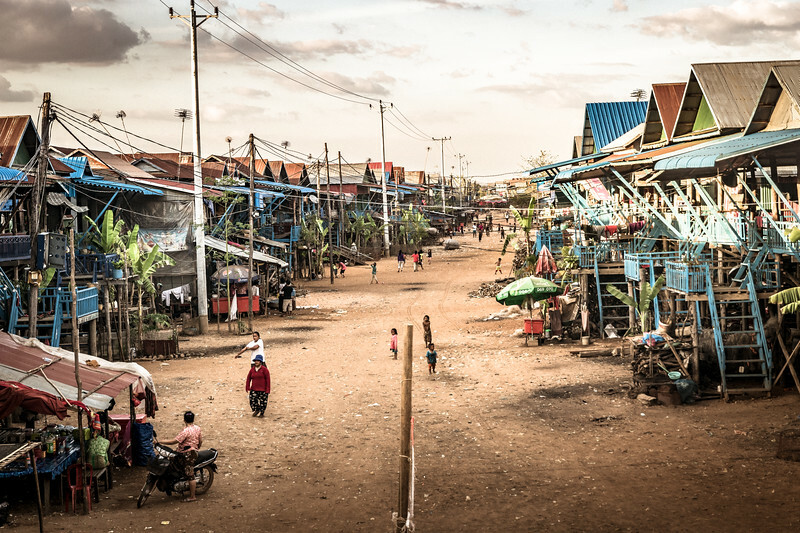 Kampong Phluk is a cluster of three villages of stilted houses built within the floodplain of the Tonle Sap lake, about 16 km southeast of Siem Reap, Cambodia. The houses of Kompong Phluk are built on top of wooden poles and stilts between 6 to 8 meters high and tower over the boats moored along the river, which snakes through the village before heading out into the huge Tonle Sap lake. During the dry season ( December when I was there) when the lake is low, the buildings in the villages seem to soar atop their 6-meter stilts exposed by the lack of water. At this time of year the main street is dry and the locals make full use of it with children playing and adults working at mending fishing nets, cooking etc. Regis (from Angkor Travel Photography) and I spent a couple of hours wandering down the main street photographing and talking with the friendly locals and children.